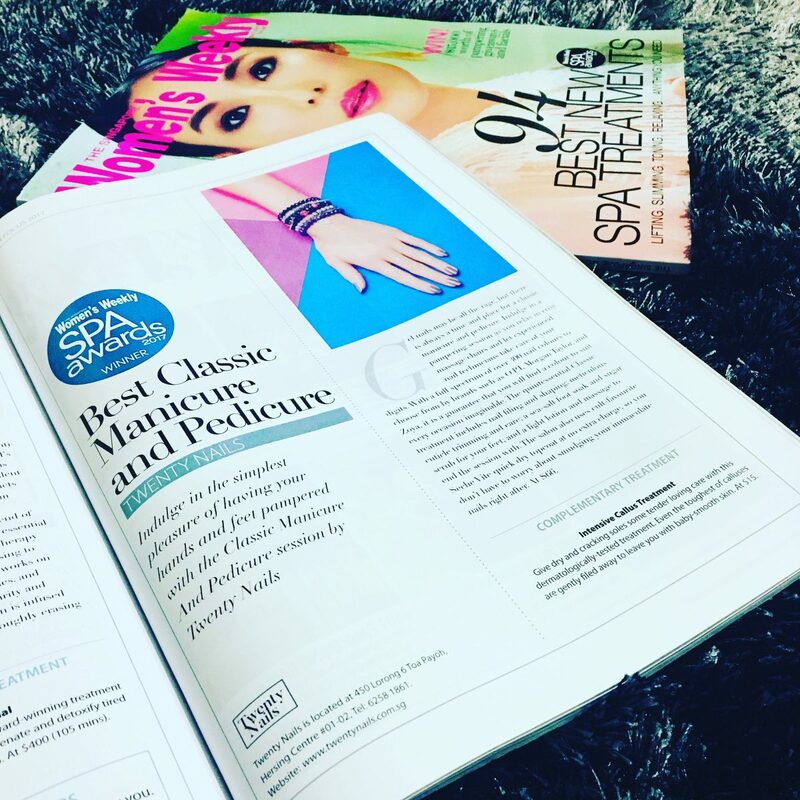 Everyone at Twenty Nails is stoked to receive the good news that Twenty Nails is the winner of the category for Best Classic Manicure and Classic Pedicure! We are thankful for the recognition and will continue to provide the best services for our customers. While gelish may be all the rage, there is always a time for classic manicure and pedicure. Wouldn’t it be nice if you could end a busy day with a relaxing manicure and pedicure? Sink yourself into our massage chair and let our professional manicurist do the magic. Much care is taken to remove cuticles and shape your nails to your preferred shape. Our honey sugar scrub softens and removes dead skin from your feet in addition to providing a totally rejuvenating and luxuriously relaxing experience. A gentle massage for your hands and feet up to knees using a fruity body cream takes away the accumulated tension. With over 300 colours to choose from, you will definitely be able to find the right colour for every occasion. What’s more, we use the renowned Seche Vite fast dry top coat and there is no extra charge for that! In addition, there are complementary services which you can add to your classic manicure and pedicure. Our Intensive Callus Treatment is a favourite. This dermatologist and podiatrist tested treatment melts away years of accumulated hard dry crocodile-like dead skin, leaving your skin baby smooth. Even the toughest of calluses are removed by gentle filing. Our customers are amazed that no cutting is required! You can add this service your classic pedicure service at just $15. Fungus growth in the nails is a common sight. Very often than not, they go unnoticed especially when they occur on the feet. Since fungus growth can spread (eeks! ), they should be treated as soon as you discover the existence. Our Anti-Fungus Treatment uses a powerful yet completely safe, clinically proven and dermatological tested formula. The formula blends nature’s best anti-fungal agents containing argan oil, tea tree oil, clove oil, rosemary oil and pomegranate extracts. A 100% natural formula, this treatment gets rid of nail fungus and is formulated to treat each specific condition (such as nail fungus, skin infection, ingrown toenails). Though multiple treatments will be required to see results, you will immediately see the formula doing the work with one application. Say bye to Fungus at just $15 per treatment! We are offering 1-for-1 Classic Manicure and Classic Pedicure (UP $66) for the first 30 bookings made from now till 31 May 2017 for appointments within the month of May. So bring a friend and share the joy! To enjoy this offer, please call us at 62581861 to make your appointment.